Fandrich powerrakes collect cones with minimum damage to trees by using a Honda engine to power rotors. Flexible fingers on the rotors strip the cones from the branches while leaving the tree intact. Powerrakes are best suited for Douglas fir, spruce and larch cones. Cones are collected in two baskets that are tripped by the ground crew to dump the load. Fandrich powerrakes weigh about 365 pounds. The Fandrich shear has a cutting blade that is hydraulically powered by a Honda engine. 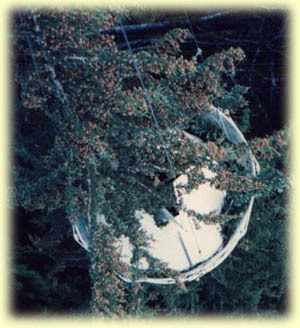 The blade cuts cone-laden tree-tops that fall into a basket. Fandrich shears are used for all species with narrow crowns. The manual unloading shear weighs 380 lbs. 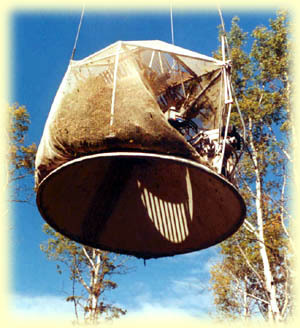 During unloading the helicopter hovers while the tree-tops are thrown out of the basket by hand. The selfdumping shear weighs 425 lbs. The pilot dumps the load using a switch in the helicopter. Unloading is faster than with the manual unloading model but the machine is 45 pounds heavier so can carry a smaller load of cones. 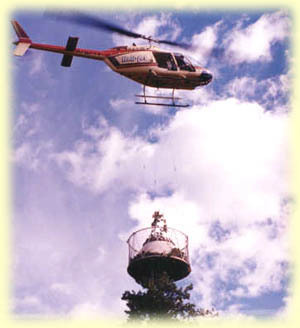 The Fandrich manual unload shear requires the ground crew to unload the cone-laden tree-tops by hand while the helicopter is hovering overhead. By decreasing unloading time from 60 to 30 seconds, production is increased 5%. The self-dumping shear is usually faster than the manual unload shear when distances from trees to dumping sites are less than 3 km (2 miles). A fast pilot with a larger helicopter who dumps the load without stopping will find the self-dumper faster up to a distance of 5 km (3 miles). 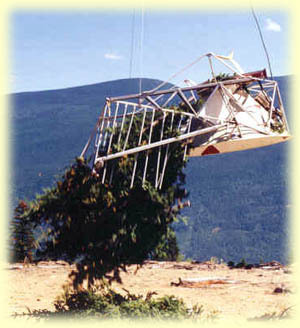 A manual unloading lodgepole pine shear has been developed specifically to deal with the challenges of collecting cones from dead trees. The Fandrich branch collector cuts cone-laden branches that fall into a basket. 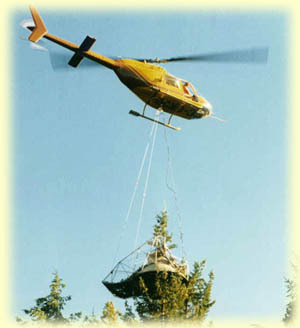 Since helicopter lift supplies the force to cut the branches the helicopter should have a lift of at least 1200 lbs. The manual latch model requires the basket to be latched on to the cables by hand by 1-3 people on the ground. The self-latching model requires one person on the ground to flip a handle to actuate the self-latching mechanism. 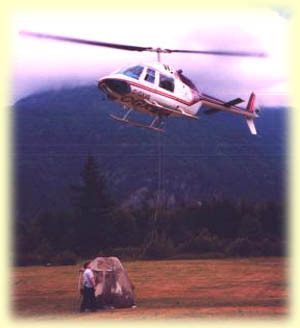 The helicopter then lifts the basket to dump the load. Branch collectors are best suited for balsam and true fir cones. The machine weighs about 310 lbs. 20-90 sec none 20-60 sec 20-60 sec.